In 1954, General Electric created the first synthetic diamonds. A man made diamond has all of the same materials and features of a natural diamond, but is created in a lab by man. This is not the same thing as cubic zirconia or glass that is used to simulate a diamond. Even thought the technology has been around since 1954, the synthetic diamond had not been available on the market until the 90’s. General Electric was still working on the technology so that they could produce a diamond that was the equivalent in quality to a natural stone. Once they managed to accomplish this, it was soon discovered that the cost of the technology was greater than the cost to mine diamonds. Eventually a company called Gemesis Corporation came up with a solution to the problem. They produced synthetic diamonds in their lab that were of the same quality as diamonds that were taken from mines. And they managed to do it for a cheaper cost. Now, this company is able to make synthetic diamonds and colored diamonds also. 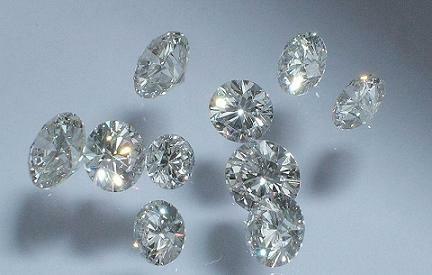 They are generally around a third of the cost of a natural diamond. The problem has now become that synthetic diamonds are becoming more rare than natural ones.